Green/Ecofriendly Attributes of Llamas as Pack Animals by Buckhorn Llama Company, Inc.
Use of llamas as pack animals has a very low impact on the environment. For this reason, they are the pack animal of choice, particularly in sensitive ecosystems of alpine and desert environments. Because they are natives of the altiplano (high plain) of the South American Andes, they are naturally adapted to arid conditions as well as high altitude (9,000-14,000'). Llamas' impact on vegetation is quite low. They are browsers and ruminants and eat small amounts of vegetation from a wide variety of plants and digest them very efficiently. They don't injure individual plants by over pruning and their manure has a low nitrogen (urea) content because of thorough processing of proteins in the forage. This eliminates "plant burn" common to simple stomached animals (equine) whose manure contains higher levels of nitrogen. They consume 5-10% the volume of feed consumed by a horse or mule. They produce a correspondingly small amount of pelleted feces (pellets are half the size of elk droppings) that contains mostly organic matter. The manure breaks down quickly and enhances the light soils common to alpine and desert eco-zones. The llama's hoof structure also minimizes mechanical damage to plant growth common with other pack stock. The llama's hoof is padded and has a large surface area compared to the animal's weight. This limits the cutting and loosening of soil that occurs with other stock. Trail degradation and erosion are significantly less because of this hoof structure. Llamas are very sure footed and work well off trail while leaving no trace. This helps disperse impacts away from the trail corridor without compromising safety or quality of vegetation. Llamas are very hardy and disease resistant. They carry no endemic diseases which could be communicated to native animal species. They are compatible with wildlife common to the alpine and desert environment and have low susceptibility to predation. They are quite capable of protecting themselves, but are somewhat susceptible to predation by large cats. 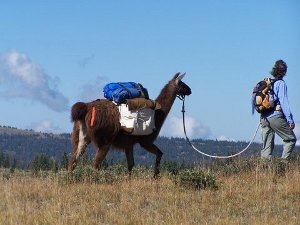 Using llamas as pack animals fits well into the low impact format of wilderness camping. The equipment, techniques, and ethic are the same only llamas carry the bulk of the weight normally carried by backpackers. This increases the range and capacity of campers allowing them to use more distant campsites and destinations in the wilderness, thus dispersing impacts from the overused, easily accessible sites. It also allows wilderness access for people with limited physical ability and supports back country activity requiring more equipment and supplies than single-focus camping. Children, seniors, and people with disabilities can more easily access destinations beyond road corridors. Trail maintenance crews, fire fighters, photographers, fishermen, hunters, climbers and others requiring additional capacity find llamas to be the ideal solution. Llamas have a low-key disposition, are predictable, and easily handled by novices. They are compatible on the trail with hikers and other wilderness travelers. Llamas are easily maintained and cared for in the back country. They don't require extra equipment or supplement feed. They are typically picketed at the campsite perimeter and can be left unattended for extended periods. Llamas easily transported to and from the trail head in a variety of vehicles (pickups with racks, vans, and trailers) with minimal preparation. They travel well for extended periods and will typically lay down in a moving vehicle. Because of their smaller size and tractability, llamas can be transported in smaller vehicles and trailers that combine animal and human transport. The reduced mileage and/or equipment required minimizes transportation impacts.